This second edition is completely revised, with over a hundred pages of new material. 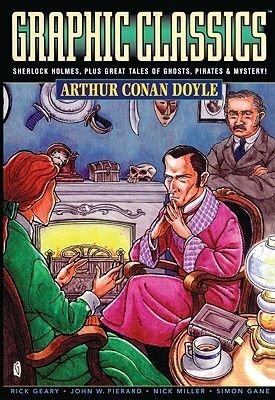 New to this edition are comics adaptations of Sherlock Holmes in "The Adventure of the Engineer's Thumb" by Rod Lott and Simon Gane, and Brigadier Gerard in "The Castle of Gloom" by Antonella Caputo and Nick Miller. Plus Doyle's fearsome pirate "Captain Sharkey," illustrated by John W. Pierard, "The Ghosts of Goresthorpe Grange" by Peter Gullerud, and "The Great Brown-Pericord Motor" by Milton Knight. Returning from the first edition are Sherlock Holmes in "The Copper Beeches" by Rick Geary, and stories illustrated by Roger Langridge and J.B. Bonivert. With a new cover by Kent Steine.